So, we all know about smart hubs and smart wifi routers. Well, Samsung Connect Home is taking it a step forward with Wi-Fi, access point, router, 802.11ac, and a smart home hub all in one. Samsung Connect Home is very similar to Google Wifi but with one major twist. It has a Samsung smart hub inside. You will be able to buy it as a pack of three, where one will function as a router and other two as a range extenders making it easy to cover your home with a good wifi. Samsung Connect Home will have built-in Zigbee and Z-Wave popular wireless standards for home automation and it will be compatible with hundreds of third-party smart home devices, such as Philips Hue Lights, Netgear Arlo Camera, and Ring Video Doorbell. There will be two versions: Samsung Connect Home (single unit or a pack of 3) and Samsung Connect Home Pro (single unit). The main difference is that non-pro version can have up to 3 devices connected. Pro version will be available as a single unit but supports the top-tier Wi-Fi specs (4×4 MU-MIMO 802.11ac). It’s advertised to be much faster though and has the same Wi-Fi coverage as a single unit of the Connect Home. Samsung Connect Home debuted new Samsung Connect app with its new flagship and at this time it is only available with Galaxy s8 with support for other android and iOs phones coming later this year. Samsung Connect app is all in one solution for managing your Wifi and Smart home appliances around the home. Like all new products, Samsung is taking its time to refine it before mass marketing it. We still don’t know the exact date of release but we can expect it somewhere in the second half of 2017. The price was not specified at this time. 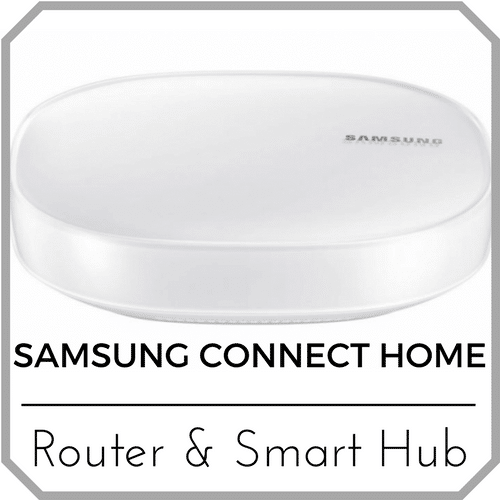 If you can’t wait for Samsung Connect Home to release you can check out Samsung SmartThings Hub what will connect your smart devices. SmartThings Hub connects with your router for internet connectivity. Controlling your smart home is easy with SmartThings. ← Best DIY Security System for Your Home? Pingback:Smart ovens...cooking anything in style and smarts!